Sometimes my sister Daisy looks around at 'nothing' and follows 'nothing' with her eyes. My daddy thinks there are 'spirit angels' walking around. Which looks similar to what you were doing. WOOF WOOF! 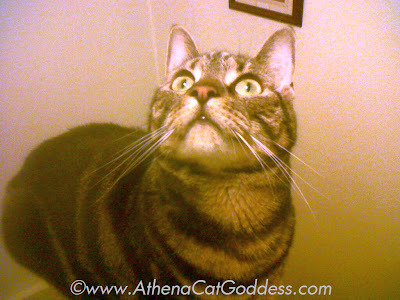 What do you see Miss Athena? Your nose is so purrfectly kissable! Happy Wednesday! A fly. I have to catch it! My mum loves to kiss my nose! A fly. But it got away! It must be a fly!!! Did ya get it? We voted and the eyes have it!!! You look like you need a kiss. Here's one: X! Purrs, Ateret, Livia and Abbi. Hey what you looking at buddy?